Guanacaste, on Costa Rica’s Pacific Coast, is a mix of beautiful beaches, lush rainforest and fascinating fauna. Costa Rica’s rich biodiversity, strong infrastructure and stable political situation make this country a popular destination for families who wish to visit Central America. This peaceful nation abolished its army permanently in 1949 and even recreational hunting is banned. Its progressive educational policies seem to have worked, as it enjoys one of the world’s highest literacy rates. If your family is interested in sustainability, eco-conscious Costa Rica has lofty green aspirations and intends to be the first carbon-neutral country by 2021. Tourism is a mainstay of this nation’s economy and foreigners are welcomed with open arms. Guanacaste’s modern airport in nearby Liberia offers many non-stop flights to U.S. cities. 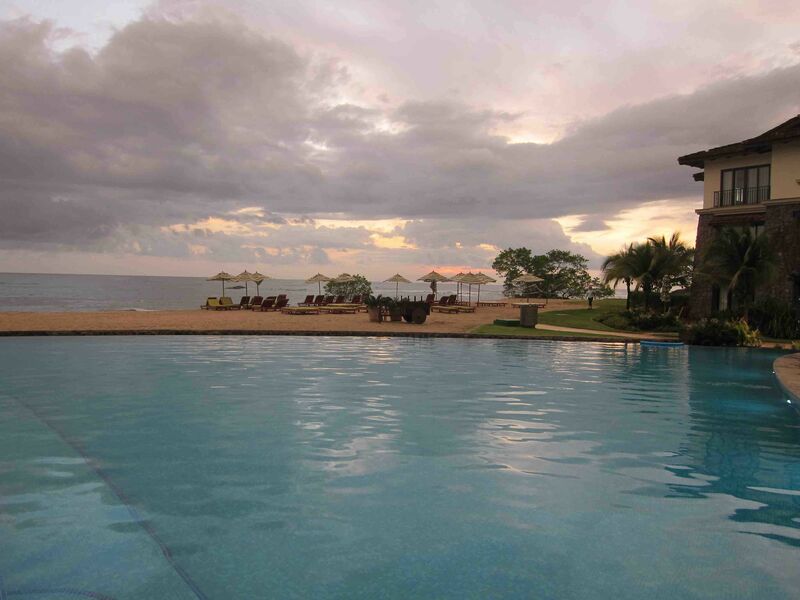 I recently visited this friendly country and stayed at the JW Marriott Guanacaste Resort & Spa. It is a great base for families who wish to explore the area, but there’s plenty to do on-site for those in search of pure rest and relaxation. 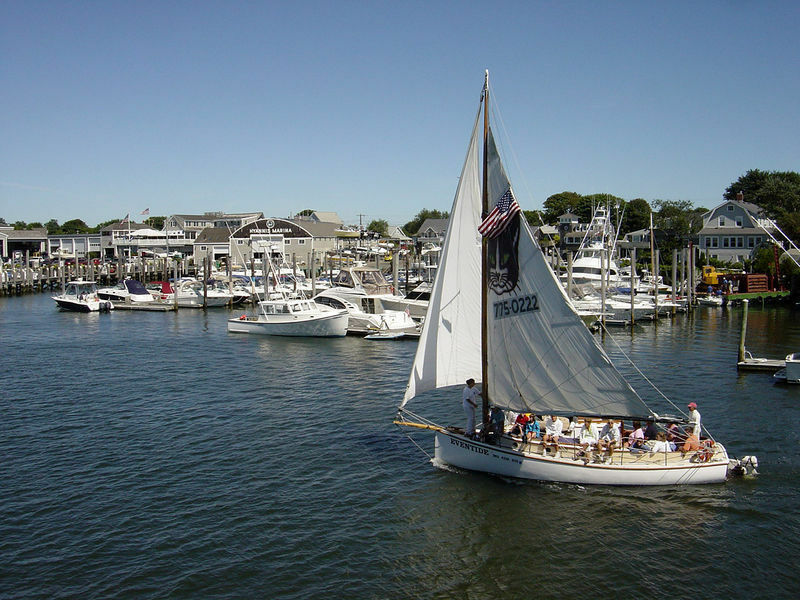 If your family is seeking a cocktail of sun, fun, active adventure mixed with a jigger of local culture, come on in. The hotel is located on Mansita Beach within the Hacienda Pinilla, a former cattle ranch, so the colonial feel is bona fide. The 310 amenity-rich rooms and suites all have private patio or terrace. 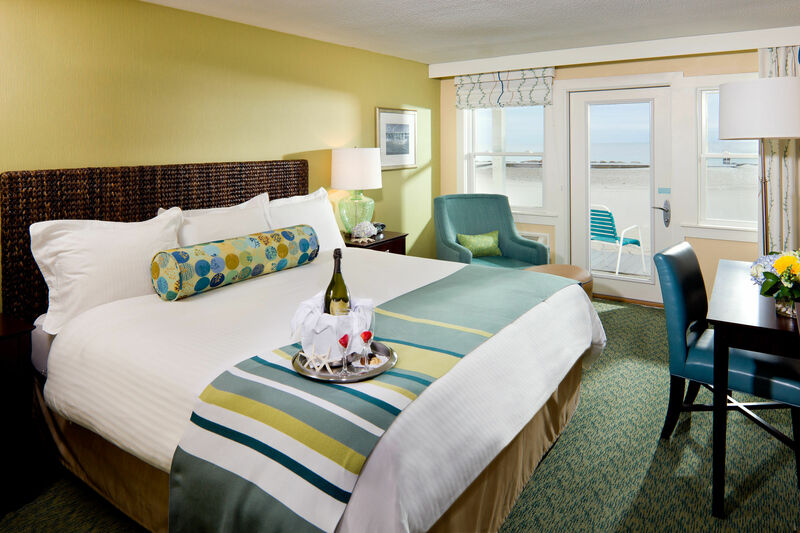 Large and multi-generational families may request adjoining rooms. The ambiance here is anything but that of your standard American chain hotel. Guest rooms are appointed with wood harvested locally and accented with authentic regional handicrafts. The landscaped grounds blend harmoniously with the surrounding rainforest. If you want to see frolicking monkeys and tropical birds, just look up at the trees outside of you window. Many families will appreciate that the entire resort is smoke-free, thanks to Costa Rica’s stringent anti-smoking policies. To Pool or Beach, that is the Question? 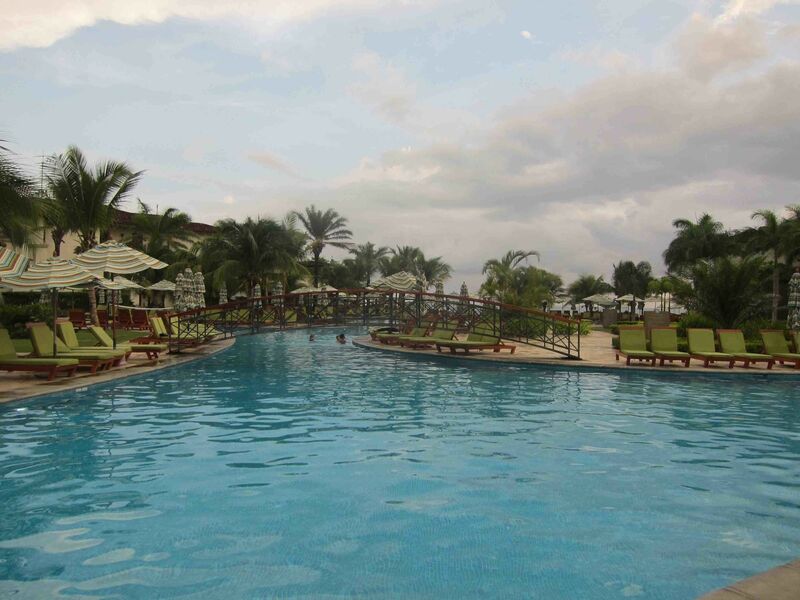 The heart of the resort is its free-flowing pool, the largest in Central America. It meanders through the resort, ending in an infinity pool that offers a jaw-dropping view of Mansita Beach. This is the spot to enjoy the sunset. No matter how many guests are utilizing the pool, it never feels crowded. It is shallow throughout, so novice swimmers can probably leave the floaties at home. If you prefer waves, the resort offers scheduled shuttles that will zip you to several local beaches, or just exit the pool and you’ll be on the white sands of Mansita Beach. Though mansita means calm water, exercise caution, as surf can be rough. Kayaks, paddleboards and surfboards are available for guests. The resort’s four restaurants and two bars offer Costa Rican and international cuisine. There is an emphasis on local and organic products and a children’s menu is available. The breakfast buffet at Mansita Restaurant is a showstopper. Indulge in tropical fruits fresh from the tree, house baked cakes and muffins, a waffle station, an oatmeal bar, made-to-order smoothies, potent coffee grown on a nearby plantation and Tico specialties like gallo pinto (rice and beans seasoned with bell peppers and cilantro). For a dash of international flavor, book a table at Tamarine, where the cuisine is Asian fusion. If your family enjoys noodles, dumplings and egg rolls, a delectable dining experience awaits you. 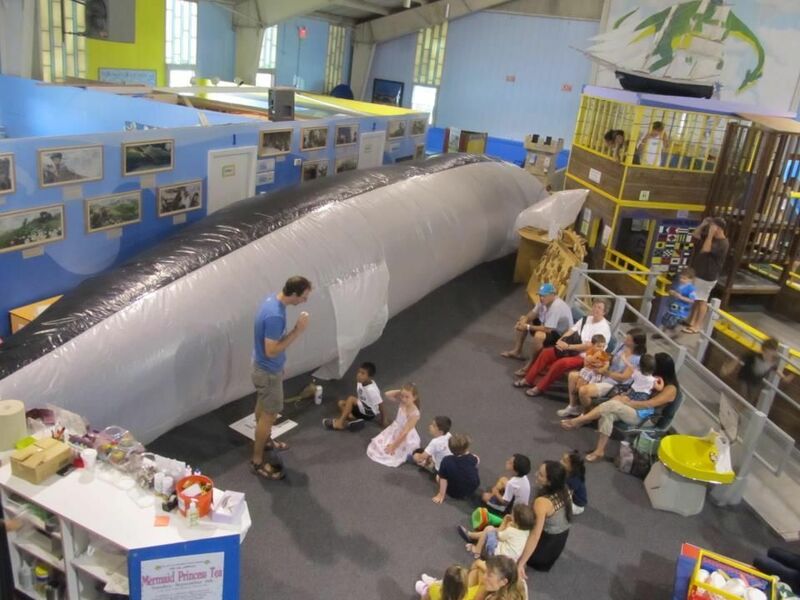 The JW Advenure Kid’s Club is open from 9am-5pm daily and welcomes children ages 4-12. 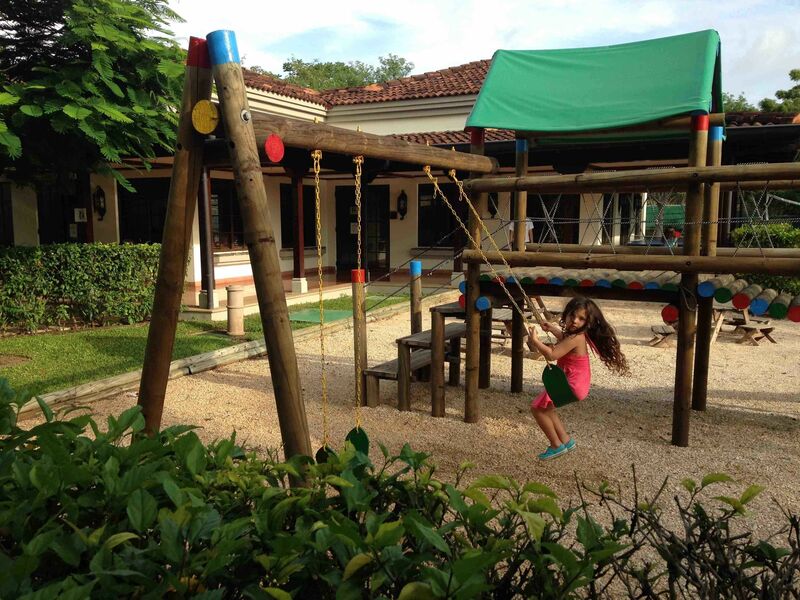 The trained staff creates a relaxed atmosphere that aims to teach young guests a little bit about their host country. The staff speaks excellent English, but don’t be surprised if your child learns a few words of Spanish. It offers an indoor-outdoor space, complete with a playground. Kids can stay all day or just for an hour and it is absolutely free. If you have younger children or require childcare at other times, the hotel offers private babysitters for an hourly fee. The full-service Spa is a beauty. Book a treatment and arrive early, because you will want plenty of time to enjoy the serenity lagoon, steam and sauna. My back was sore from the previous day’s zip-line canopy tour, so splurging on a massage seemed justifiable. It was the perfect elixir for my middle-aged aches and pains. There are many advantages to the hotel being located within the hacienda’s 4,500 acres of ranchland and dry tropical forests. 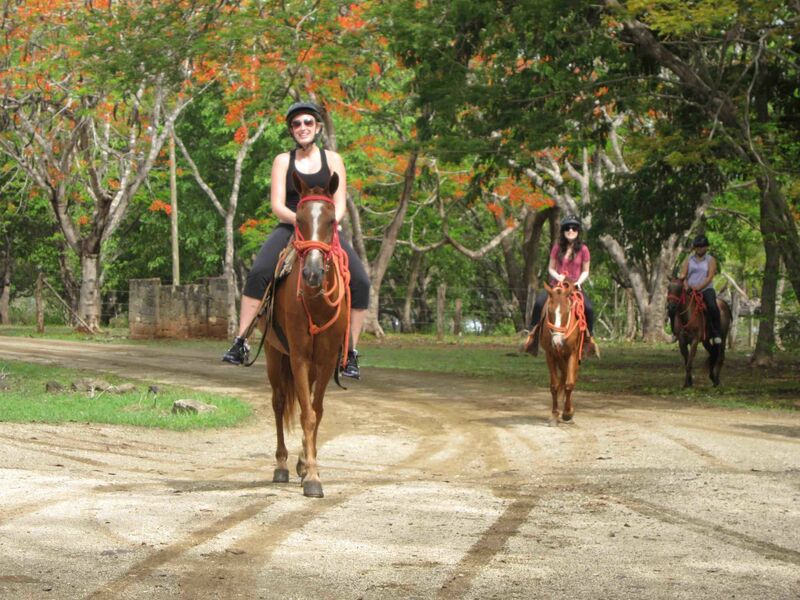 Hacienda Pinilla offers horseback rides that will take you through the forest and onto the beach. These horses are gentle, the ride easy enough for first-timers. Golf at the hacienda’s 18-hole championship course is a popular family activity. Just let the concierge know and they will take care of all the details. Hotel guests get a discount on the greens fees. Get an early start, as temperatures heat up as the day goes on. Guest’s of the Marriott are invited to visit the elegant Hacienda Pinilla Beach Club at no charge. The infinity pool is lovely, though not nearly as big as the giant pool at the JW Marriott. The beach here is excellent for surfing. There are regularly scheduled shuttles that circle Hacienda Pinilla, and it just takes a few minutes to get from the resort to the beach club, golf course or stables. 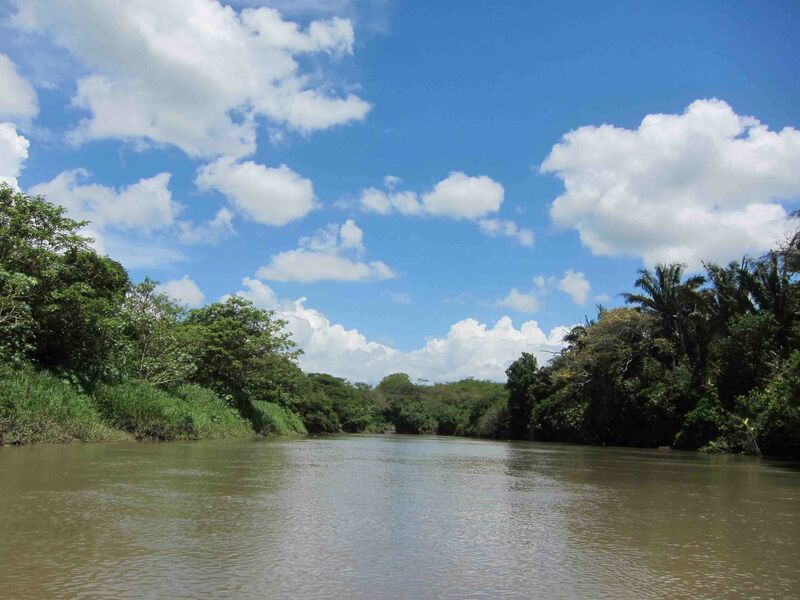 The shuttle can take you to the town of Tamarindo, a popular tourist destination. Surfers are drawn here thanks to dependable waves and shoppers won’t leave unsatisfied. This scenic country merits explorations. Swiss Travel has a desk just off the hotel’s lobby and they offer a wide range of excursions well suited to families. They can organize Canopy Tours, also known as Zip-lining, which the Costa Rica claims to have invented. It is a thrilling way to view the country’s dense rainforest. We enjoyed our escorted visit to a ranch called La Casa del Sabanero. Sabanero means cowboy and our visit taught us something about life on the range. The main house is nestled in between acres of sugar cane fields. 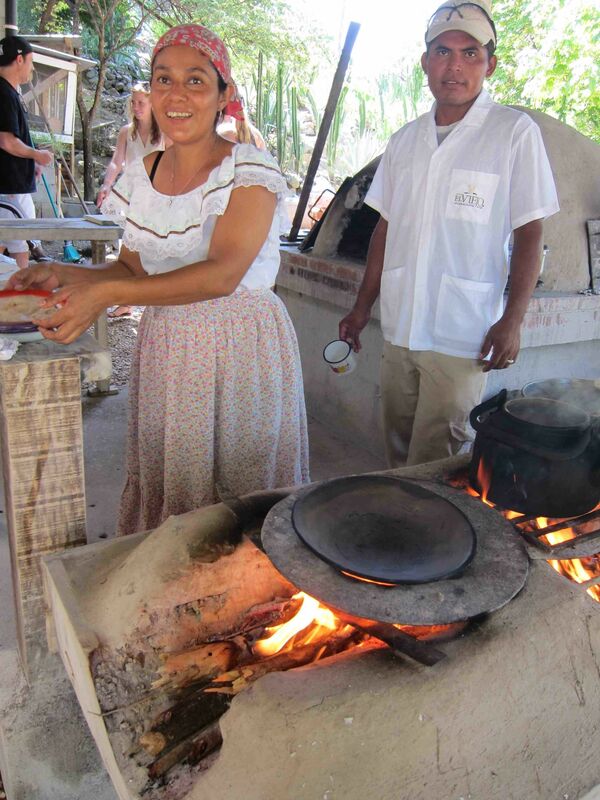 A group of local women were on hand to teach us how to make corn tortillas, cooked in an outdoor kitchen over an open fire. We pummeled the pale yellow masa into circles with the pads of our fingers. They were a delicious served with fresh guava juice and potent Costa Rican coffee. The sounds of live acoustic guitar and Spanish vocals were the perfect accompaniment for our snack, as you can see in my video. If you crave a look at local wildlife, book the tour to Palo Verde National Park. 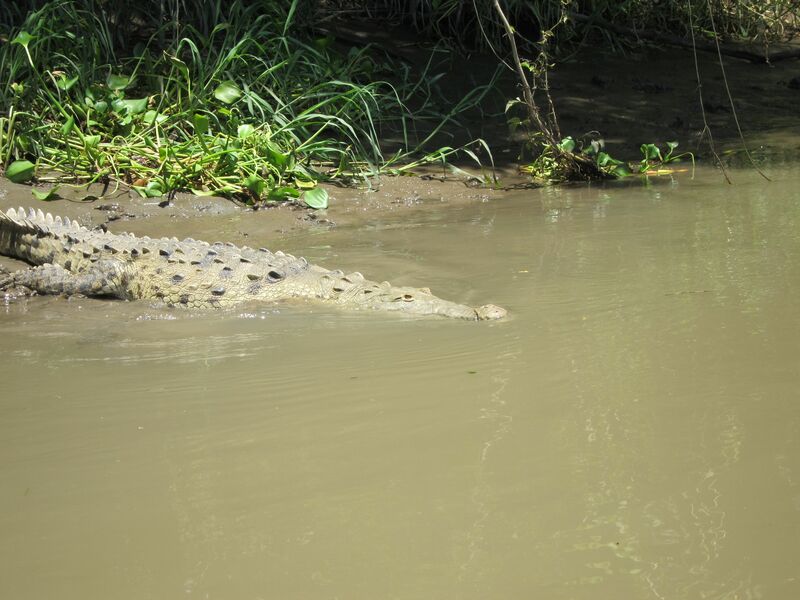 This wildlife sanctuary offers the chance to get up-close with crocodiles, monkeys and colorful birds as you meander down the Tempisque River in a boat. All of the Swiss Travel guides speak excellent English and are happy to engage in conversations on a variety of issues, from politics to the environment. 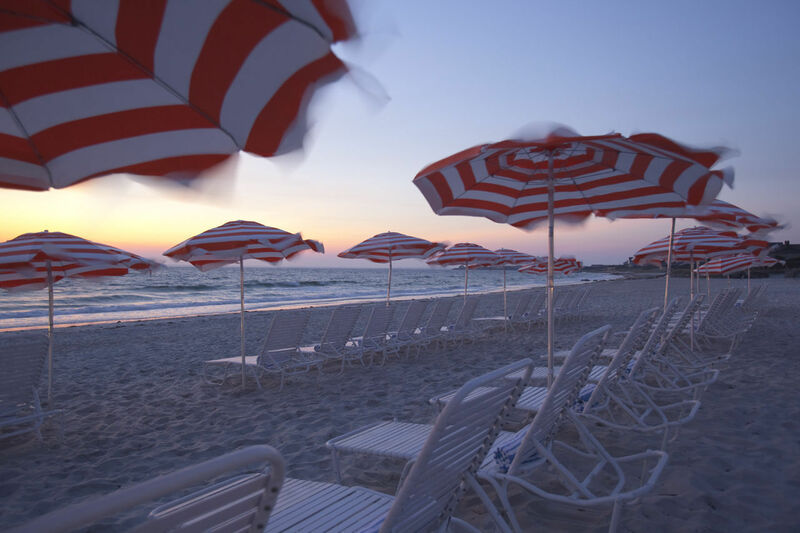 You may want to consider the weather when planning your vacation. Guanacaste is divided into a dry and rainy season. The rainy season starts sometime in late May and ends in November. This is when you will find a verdant paradise, but the catch is that it will rain for a spell most every afternoon. During the December-May dry season, the panorama less colorful, but sunshine is assured. For more information on planning your trip, log on to the official site of Costa Rica. For more information and the latest travel specials and off season promotions, click on the JW Marriott Guanacaste website. Next Article Next Article London: Wouldn’t It Be Luverly?